How do I make the most out of winter? Does my skier have the right clothing? What classic ski length is appropriate for kids? We know that plans don't always work out! Embedded video for Do you ski like Jessie? Embedded video for Welcome to the Minnesota Youth Ski League! *******OVERALL SERIES RESULTS******* are attached below. Also all race results. We were not able to get names of participants in the MinneLoppet, so if your child did this as a second race in the series, let me know and I will prepare a certificate. And of course, let me know if there are any other corrections. Compiling the results was a bit more challenging than expected (too many different results formats), but now we know better for next year! 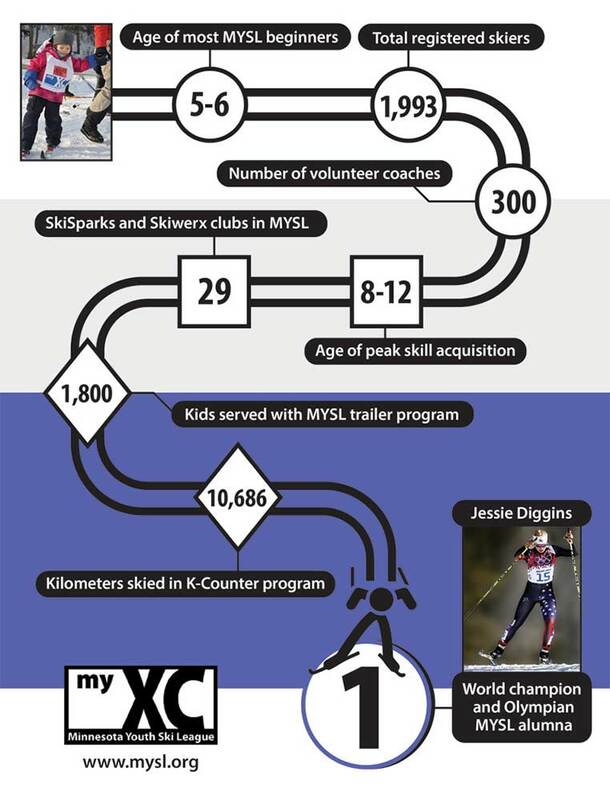 Certificates will be handed out on March 7th 2pm at the Wirth Chalet (MYSL Great Ski Together). Certificates and medals (for J3-J5 overall) will be handed out at Wirth on Mar 13th at noon up in the stadium (Midwest Junior Championships). Congratulations to all of the racers! What a great way to voluteer for a great organization! Contact Amy with questions or to express interest. Amy Cichanowski , the new Executive Director of the MYSL, took advantage of her first season (2005-06) to visit many of the MYSL clubs. "It was definitely the highlight of my first year; seeing all of the kids and meeting the volunteer leaders and coaches that make our League possible. And it's also important that people know who I am," says Cichanowski. Cichanowski, who had her husband, Marc, and 8 month old daughter, Ursula, in tow most of the time, journaled about her experience. "I wanted to see how the different clubs are run and distill the best aspects and ideas into a toolbox for all clubs to use."